when my father was growing up, he earned the ignominious nickname, "crash bang." not that he deliberately set out to break things, it just happened. there can be no doubt that i am his daughter. a few weeks ago, i was cutting a butternut squash to make some soup. i started with our biggest scary knife, and as the pieces got smaller, i moved to the medium-sized knife with a sense of relief. all fingers intact; so far, so good. 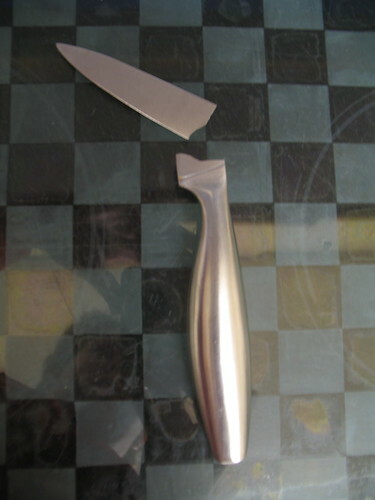 ironically - or perhaps inevitably - it was while i was cutting the rind off a small cube with the paring knife that the handle split, leaving the blade inside the squash. need i add that the paring knife is the one we use the least? Squash is the devil's vegetable. I would avoid it and now you know why.